Want to get more affordable DIY projects like this one delivered right to your inbox? Did I mention it’s free? SIGN UP HERE! Remember when I answered all your burning questions and you asked if I ever messed up on anything. And I was like, All. The. Time. Ok, this project was one of those trial by error projects. Luckily, its result was stellar – stellarly good looking and stellarly cheap as well. And I’m aware stellarly may not actually be a word. 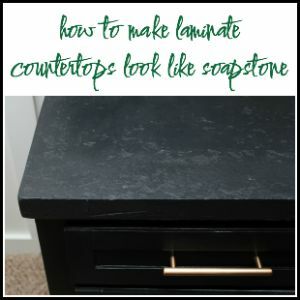 Dear friends, let me show you the cheapest and easiest way you can turn those ugly laminate countertops from yesteryear into beautiful “stone” counters. At first glance, what kind of material would you think that countertop was made of? Stone, right?! But it’s totally not – that countertop was once a regular old laminate countertop! Complete with shiny brownish-burgundy countertops circa 1970. Initially when Grunt Labor and I did a “lazy job” of redoing this space, I painted the countertop. I knew good and well it would end up scratching off, but I didn’t really care because I was pregnant and just wanted to lounge around in my fold-out lawn chair and eat chocolate while I still had a good excuse to do so. And what did the countertop do after it was painted? It got lots of little scratches here and there. Just like I knew it would. A few months back when I really committed to overhauling this space, I knew I couldn’t leave the countertop as it was. I had lots of ideas – I would clad it all in pallet wood, or 1 x 4s, or pleather with nailhead trim….. Then, I had a better idea, I wanted to make it look like soap stone. I would paint it black, then come back with a tiny paintbrush and maybe add some grayish-whiteish veining. Pssssshhhhhh…..As if I actually have the patience for all that. After I realized that idea was a bust, I had a thought. I wonder what this countertop looks like underneath the laminate. So I started tearing it off…. Topcoat – I used wax, but if your countertop is going in a kitchen or where water is often being used, go for a polycrylic topcoat. Starting at a corner of the countertop or a side, gently hammer your pry bar, drywall knife or scraper under the laminate of your countertop, then pop it up. 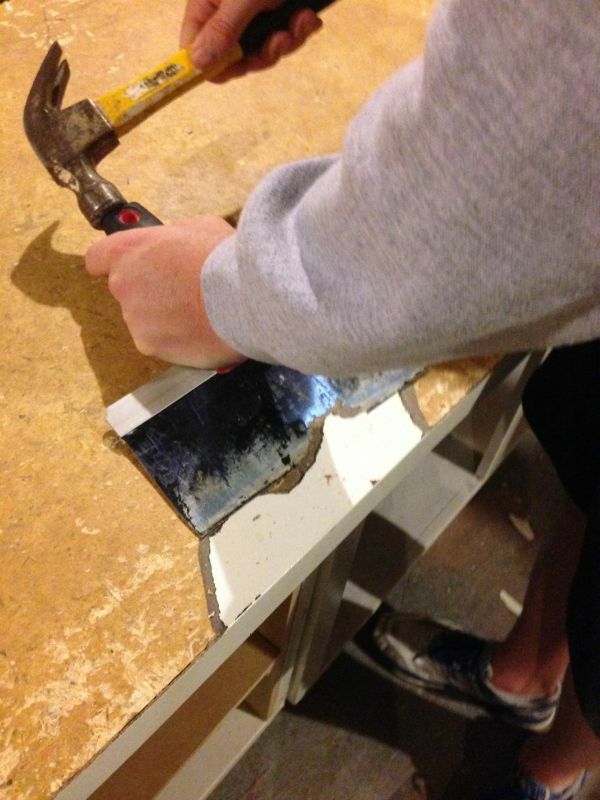 Continue doing this until your countertop is sans laminate and all you are left with is a piece of wood. It is totally ok if you make a few nicks, scratches and such on the wood as you tear the laminate off. If the wood is too rough for you, give it a light sanding with a palm sander. I did do this, as there were a few splinters sticking up that I wanted to take care of. A very light sanding is key here though. 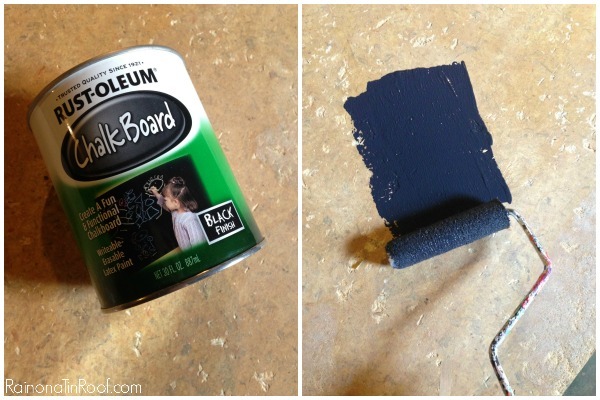 Once you are satisfied with the texture of your wood, give it a minimum of two coats (but I did three) of chalkboard paint. After the paint is fully dry, you need to seal the countertop. I used Minwax Finishing Paste Wax. I am not a fan of using waxes usually, but I knew the wax would keep that muted look of the paint so it looked more like stone, but still protect it, so that’s what I went for. To apply the wax, I used my AutoRight Detailing Polisher. I put some wax on the foam applicator, applied it to the counter, let it sit for 20 minutes or so, then came back with the microfiber bonnet and buffed it. The polisher makes it sooooo easier to apply wax to pieces. If you are doing this countertop technique on a kitchen countertop or bathroom countertop that is going to be getting a lot of use, I would highly recommend you using a more heavy duty sealant like a polyurethane or polycrylic, which would hold up to water much better. Since this project was completed, we have actually moved out of the house where this countertop is. We were there for about two years though with the countertop and it was holding up just fine! My in-laws actually live in that house now and the countertop is doing well for them too! Could I put food directly on the countertop? Since you’re using a wax or polycrylic topcoat, I would suggest that you not put food directly on top of the counters. Can I use a different kind of paint? So I used the chalkboard paint because I had it on hand and because it had that flat, black color, but a little grayed out like soapstone looks. I think that you could use a different paint, however I would definitely suggest using a flat finish paint to get that stone look. Want more DIY countertop makeover ideas? 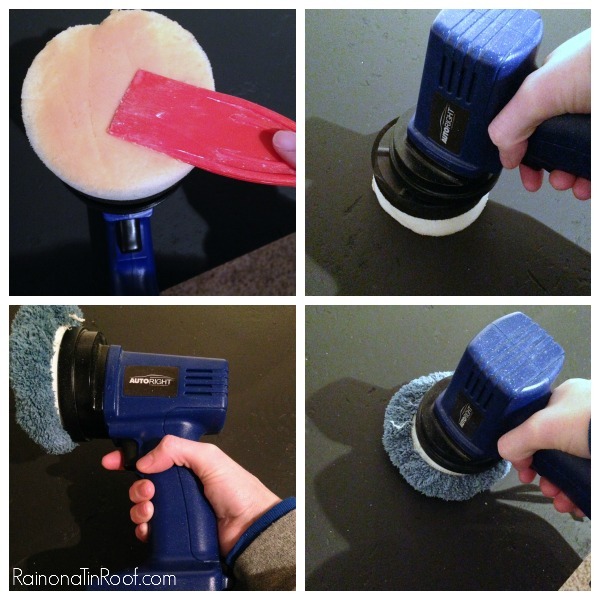 Ok, you may have just discovered the best faux soapstone technique E.V.E.R! Seriously, that looks so real. Now I wish I had an old countertop to redo! Totally trial and error, Angie! Honestly, I was shocked it all worked out!! haha! I love it ????. I’m going to redo r kitchen boring white very soon using yr idea. Great job, great adventurer. Congrats ???? did you ever do your kitchen countertop white? My favorite thing is experimenting and then having it come out awesome. Doesn’t always happen, but it did this time! Pinning! I know right, Jenise!? I’ve had so many failures, glad this one was a win! I rarely ever sit in front of a computer and laugh out loud all by myself. Today I did! You just cracked me up. My daughter came by about that time and asked what was so funny. I just pointed to the screen and she read your post. After reading it she grinned and said, “Mom you laughed so hard because it sounds just like you!” What a compliment! No kidding, not only informative and inspiring, but very funny. Thanks! hahahaha! That is fantastic, Linda!! I just discovered your blog, and loved this post. Not only did does the faux soapstone look amazing, you cracked me up too! Like, real, burst out loud laughter! Thanks for this awesome post! Pinning and going to read more :). Hi Minky! Laughter is always my number one goal. 😉 I’m so glad you found me! haha, Chris! Removing the laminate with the pry bar is also great therapy! Take out some frustration! That looks amazing! If I have laminate countertops I’m going to do that. I love how you didn’t give. I know a lot of people (ahem…my husband) that would give up and throw it away before thinking outside the box. They are stellarly gorgeous. These look fabulous!! How are they holding up to daily wear and tear? Hey Carol! Its only been like this for a little more than a month, but so far, so good! Now that ot has been several years, do you have a picture of it? How did it grow old? Hi Alison! Unfortunately, we don’t live in the house anymore where we did this, but my in-laws now do and so far, it’s held up just fine! WOW!! Thanks for taking a chance on what could have been a mess but came out awesome! This is a great look for all of us with older houses!! Yay, Shelley! I’m thrilled you like it – and super glad it worked out, otherwise it would have been a hot mess for me! haha! looks REALLY good. My husband would have killed me if i started ripping off the laminate too..glad yours trusted your crazy ways to see your end idea!! My husband has learned not to ask questions. I love the use what u got on hand method. Sometimes it works sometimes it turns out so fabulous u have to write a blog about it…… Love the counter tops. Thanks, Liz! Mine is finally getting there!! I approached him about painting cabinets last night and there was no opposition at ALL! Shocking! Ok, this is genius! AND amazing. I hate our countertops in our kitchen. Heck, I hate them in our bathrooms, too. This is a great idea to update them! Is this wood under every laminate counter? I’d be scared to rip it all off only to find something totally different! Love the idea either way, totes pinned for future reference! Hey Amanda! I cannot attest to this wood being under every laminate countertop. If I were you, I’d try peeling back the laminate in an inconspicuous spot like a corner or something! Hope that helps! Did anyone do this in their kitchen with the proper sealant? I’d LOVE to see how it looked and if it held up. I’m pretty sure our laminate is sitting on top of particle board – I wonder if we could do this? Our painter painted the laminate nearly two years ago, but it’s rubbing off in places – I would really like to re-do in a less busy pattern than she did – too difficult to see where you need to wipe up, as the busy pattern is camouflage for EVERYTHING!! Great job! Hi Laurie! I’m not 100% sure if it would work on particle board or not. If there is a small spot you could peel up and test out, I would try that first! Jenna ~ This is really impressive! Simple and stunning! I’m hoping to redo our kitchen counters this summer. Although I’m wanting a butcher block look, I’m so glad to have this option in my back pocket (because I’ll likely seriously mess up my kitchen counters). Thanks! I couldn’t believe how easy it was, Tiffany! Jenna, how are the kitchen countertops holding up? These are doing great for us, Kim! However, like I mentioned in the post, we did this on a counter that is in the man cave – so it doesn’t see a lot of food and liquid action like the kitchen would. I there! I’m wondering how they are holding up now!? They are beautiful! Hi Bethany! So far, so good! I do have to say though – where these countertops are – they don’t get a lot of hard use, which could be a factor. You are my kinda crazy! Freaking awesome. Pinned for when I can’t find my stressball. Hey Linda! Ok, I just found out about a new product. Its called Tainted to Repainted Countertops: http://taintedtorepainted.com/videos/countertops.html. It doesn’t look like they have any videos up yet, but I just saw it demonstrated at a conference. Its a kit that includes everything you need. If I remember correctly, first you prime the counters, then you apply paper that looks like marble, granite, etc. (you pick which one), then you seal it. I actually tried it myself and it is pretty easy to do and it looks great! I hope that helps! Do you think I could do this over my concrete countertops that my contractor screwed up? I don’t know about that Maggie. I think you could probably paint them, but I don’t know that you could chip them off like I did the laminate without it causing a huge mess. You can paint and seal concrete if you use a breathable paint made specifically for that purpose – I don’t know about using it on a food prep surface, though…. What would you suggest for a lighter version? For a lighter color, Jessi? I think if you went to your local home improvement store and looked at paint chips for a dark gray and got it in a flat finish that would work. 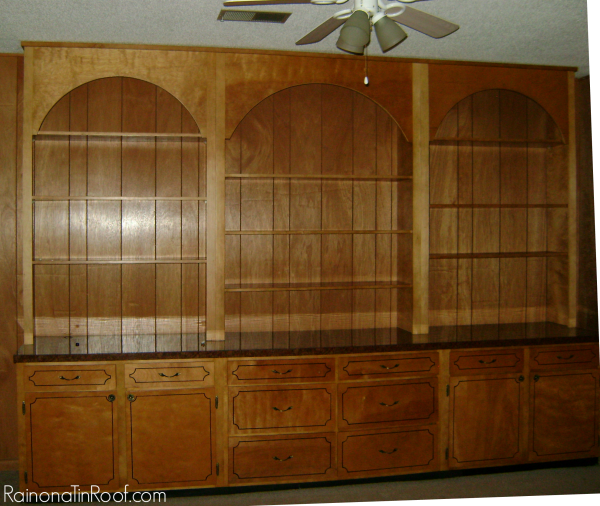 I have hideous matching laminate cabinets and counter tops… I wonder if I can do this to the cabinets as well? I don’t know, Donna. Is there a cabinet where you could test it out and it wouldn’t really be seen if it didn’t work? Oh yes! Good timing! I am having a mini makeover in my kitchen and want to add worktops to create more working space. Problem is I want it to match my current worktops. Which is no longer made, and rather ugly to be honest. So, I am faced with not only adding new worktops but replacing old ones to match too. Now I Quite fancy having a go at this! Makeover on the current ones and when I get the new ones, make them over to match! No full replacements! Hi Jenna! 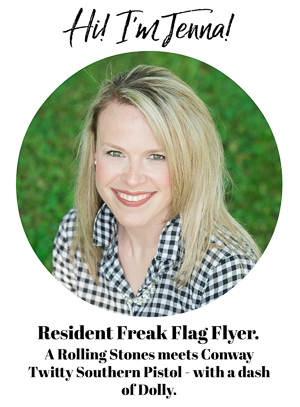 I just emailed you about being featured on Remodelaholic, but my emails sometimes get caught in spam filters so I wanted to leave you a comment as well, just in case. Drop me a line at [email protected] please! OMG!!! Love this. Going to try on a small section when I get home! I have ugly green laminate counter tops… hope this works on mine!!! Thanks so much for sharing!!!! You are welcome, Sydni! Hope it works out for you! Mine didn’t really look like cork board, but it did look like compressed wood pieces, all glued together. Does it look anything like the picture of mine in the post where the counter was stripped before painting? Does it have some texture to it? Can you paint a small patch and see? I don’t have any laminate countertops to try this on so I am going to buy a laminate countertop to replace a solid surface counter/integrated sink that I hate. For around $50 it’s worth a shot! My question is, would the finish still turn out like it looks with the wax if poly was used on it? It looks like the wax is the part that really makes it special and gives it some depth. I think it would turn out the same – maybe slightly different – if you use as matte of a polycrylic as you can find. Also, if you wanted to try it out first, look for old countertops at a Habitat for Humanity Restore. You may be able to get a small piece for cheap and see what it looks like. Really enjoyed this! I burned the kitchen laminate countertop with a hot cast iron pot a few years back. Oops. The problem is, I have a sink that is set on top of that laminate countertop. I guess I can’t apply this technique to my kitchen laminate countertop 🙁 Or can I? How? You could, Anna. but you would have to disconnect the plumbing, take the sink out and put it back in. Another possibility is that you could take the laminate off right up to the sink’s edge and then do a good line of caulk around the sink. Then do the paint and everything else. Starting a kitchen remodel and saw this idea on pinterest. We were looking at new countertops, as we have worn the color right off the old laminate, and now have a viable, less expensive alternative to try. My wife removed the laminate on the peninsula this morning and I am painting it after work. We will clear coat it and let you know how it goes. Awesome, Brad! I hope it works out! How well is your countertop holding up? Could you do a post-post? It’s done great, Leslie! Nothing bad to report at all. Now, keep in mind though that this is in our “man cave” so it doesn’t see as much action as a kitchen counter would. I did this and failed miserably :/ There are 2 types of people in the world: those who can DIY and those who cannot. Oh no! I’m so sorry, Ashley! What went wrong? So, I’ve had this pinned since before we even had our own house! Now that we do, I’m SO ready to do it to our kitchen. But…my countertops have a stupid rounded/bull nosed edge. They’re laminate, though. Any idea if that edge piece is like a piece of trim I can remove after I peel off the laminate? My big fear is, I’ll be stuck with rounded edge “stone”. Hmmm… Brooke. I don’t know. I’ve never had countertops with that rounded edges. I do wonder though if after you removed the laminate if you could take something a little jagged – like a pry bar and “rough up” the edges. The countertop looks great and seems like a good alternative to replacing my kitchen counters (plus, much cheaper!). Was your use of the chalkboard paint a result of what you had available to give you the look you wanted? Do you see any reason I can’t use some other type of paint, given that I will likely cover in some polycrylic? Hi Thomas! 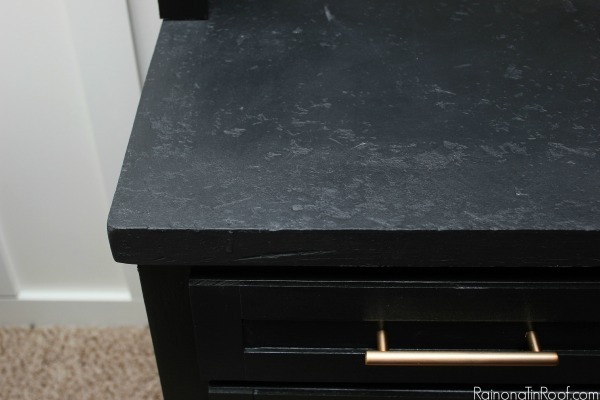 I used the chalkboard paint for two reasons – I had it on hand and it gave the black look I was going for – not too black, but more of a stone colored black. I definitely think you could use another kind of paint if you are putting polycrylic over it! I did something so similar to my kitchen counter! But I tore off the laminate while hubby was away. I used my iron to heat areas of the laminate as I tore it away from counter beneath. Came off in smooth, big chunks that way. Then did a sanding, then some stain then epoxied it! Totally water proof around my kitchen sink! I do have to be careful about putting hot things directly on the counters, but otherwise it’s great! Goodbye purple (yes, purple!) laminate, hello wood looking countertops! Awesome, Lisa! That’s a great idea! Can’t wait to show this to my daughter-in-law!!! She’ll love it!! And she has countertops that she hates!!!! Thanks!!! OMG! I’ve been looking for ideas like this for soooo long!!!! I’ll never thank you enough for it!! hahaha!! Glad I could help, Annie! Hmmm, Meghan, I didn’t really have any glue on the top of mine, it had been nailed down. Yes, though, I think I would try to sand it off if you can. So we bought a house and this pin is on my list to do in the kitchen. 🙂 I will us the polycrylic or this product I found that has a flat finish but creates thst water barrier (can’t remember the name) as suggested since it is a high use area. My fear is tearing off the laminate and it not having that stone texture. So my question is, should it not have the texture I am looking for or doesn’t hold up, do you think it would be ok to do the feather concrete technique over the particle or over the polycrylic? Any help is appreciated! Hi Alison! I would think you could do a feather concrete technique over the wood underneath, BUT I have never worked with concrete before, so I can’t be sure. Sorry I’m not much help! So fabulous! I might have to do this in my kitchen. I have to ask, does it have a stone counter feel to it? Not necessarily in texture, but just solidness, temperature, etc. Hmmm….well, it doesn’t feel as heavy as a stone counter of course. These are old countertops though and so it’s more solid than newer laminate ones I believe. Hope that helps! Oh my gosh I couldn’t love this project more. I don’t even have laminate countertops anywhere and now I wish I did 🙂 They look just like honed granite, it’s crazy! Thanks, Lisa!! It was a total crapshoot, but I’m so glad it turned out well! As if I don’t get enough “Aha moments” I find a new one. LOL! My husband and I are renovating our whole house now that we only have one child home and he’s off to college in the fall. We had priced granite counter tops and I nearly had a coronary, $3,500! I love to squeeze a penny until it screams and this will be the perfect project. The last time I ripped out laminate we put ceramic tiles over the wood, the grout is a pain to keep clean and it chips, this will be perfect. I can’t wait to see the look on my hubby’s face when I say….”Look what I found on Pinterest.” LOL! I can’t wait to try this, thank you. Awesome, Linda! I know – countertops can be SO expensive!! 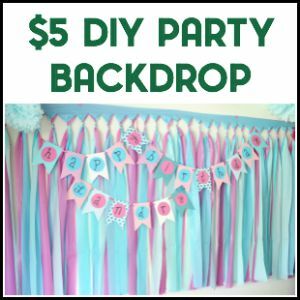 This is a really easy project instead! It looks great! So is that like a particle board wood material underneath the formica? I’m not 100% sure, Kerry. I think so, but I think it’s a pretty touch particle board – not like flimsy ones we would get in stores. 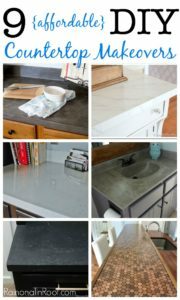 I happened to stumble onto your blog and saw this countertop project. WOW!!! This is amazing! I’ve been searching for alternative countertops because I really don’t like the look of granite. What you did here is incredible and I can’t wait to look through your entire blog! My question for you (since I’m inexperienced with finishes): Would it work to seal the countertop with polyurethane after applying the wax? I understand why you chose to finish it off with wax because it does give it a natural stone look, but I definitely need something more durable for the kitchen. Thank you for sharing your ideas and for taking the time to respond to everyone, even though you originally posted this over a year ago! The fact that you do this is making me subscribe!!! Hi Christine! Sorry it took me a while to respond, I got busier than expected this week. So, yes, it sounds like you’ll need more protection than just a wax. If you are going to do a polyurethane or polycrylic topcoat, then I think you could skip the wax coat all together. As whatever it made the counters look like would be negated by the polyurethane or polycrylic. Hope that helps! Yes, that helps. Thank you!! Oh wow, Chessie, what a compliment! Thanks to both of you! And I totally get what he means by a project looking too “craft-ish.” I’ve done a few of those myself and they never last long around here because I just don’t like that look! WoW! I have been thinking about something like that for a couple of years. Either that or I was going to smear concrete on the countertop and then paint. Your counter top looks great. How are they holding up and would you do anything different? Hi Chris! We moved out of the house where this countertop is, but my in-laws live in that house now and it seems to still be holding up fine. I don’t think I would do anything differently, but if you did put this in a kitchen, I would recommend using a tougher topcoat such a polycrylic or something similar. So how well is it holding up. I am tempted to try this in a kitchen. But it would get more wear. Hi, I am wondering, in your picture it looks like there is littler a darker spots on the counter that really gives it that stone look. But you only painted with the one color… Did it just naturally varying in shades with the “markings” on he counter or did you have to do something? It just naturally did that, Cassidy. All I did was use that one paint. Hope that helps! Would the top coat be food safe is using in a kitchen. What about the polycrylic? Would it leech into food? I wouldn’t suggest sitting food directly on top of the counter and then eating it. Your countertop turned out beautifully! If you re-apply wax they will continue to hold up nicely. Usually, every six months is needed for high traffic areas but once each year should keep your finish in good shape. I really do like the look! Much better than laminate. I’m lucky to be graced with those too. That is awesome to know, Olivia – thanks so much for the tip! I’m remodeling my camper and I came across your blog. If I wanted a lighter concrete look without the weight, could I use this same idea but with a gray paint? Or does it have to be chalkboard paint? I think you could probably do that, Anna. I would use a flat or satin sheen of the gray paint to get that concrete look. This is DIY at it’s brilliant best. You are awesome! I have tile squares on my bathroom countertops that are attached to one sink. Do u think I could chop up the tile and do that? Honestly, Sherry, I’m not sure. I haven’t ever tried anything like that before. We are purchasing a house from the 60s with original builder-basic white laminate countertops and I’m wondering if underneath ours will be the same. 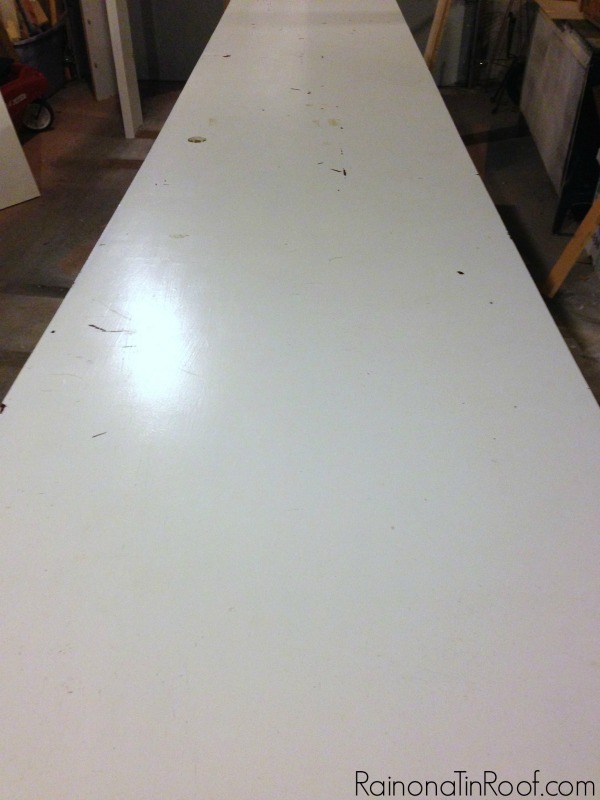 Do you know if most plain white, basic grade laminate countertops are like this? Such a good accident-idea! Lol. 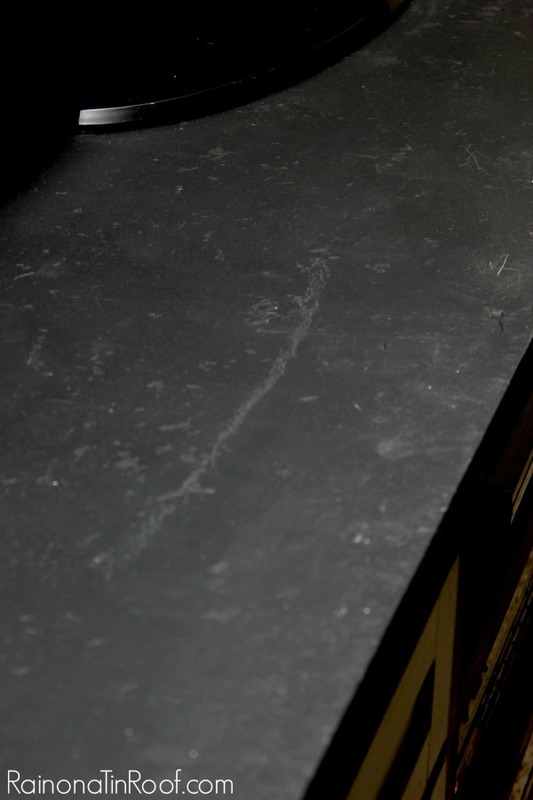 Black soapstone would just look so good in our house too. Thank you for putting this up! Hi Audrey! I can’t say with 100% certainty that it would be like this or not. I would think so, but am not for sure. Maybe you could try peeling off a little piece somewhere that is kind of out of sight? What did you do for the backsplash/back edge between counter and wall? I just did it like I did the rest of the countertop. 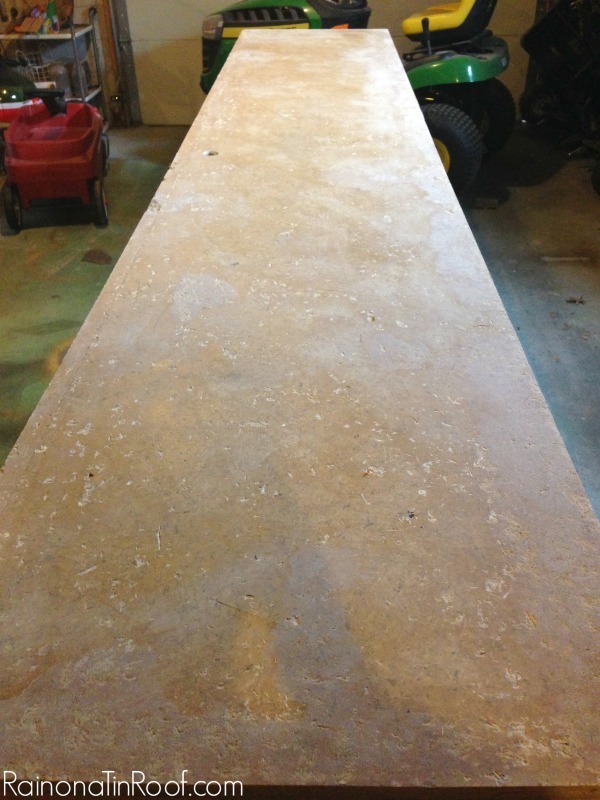 I didn’t have an edge on this countertop that came up the wall – it was just flat against it. I’m in the process of trying this. I loved the finish with the chalkboard paint, but because this is in my kitchen I did one coat of a satin poly and it totally changed the look. It is more black than the charcoal/black it was before and too shiny. I’ve lighted sanded the top and am trying to figure out what to do next. I ordered a Matte Poly but didn’t know if I could paint another coat over my sanded poly coat that I have now.. Any advice? I was so bummed with how the poly changed the look. I didn’t know if I should try just the matte poly when it comes in, or paint another coat and then poly? 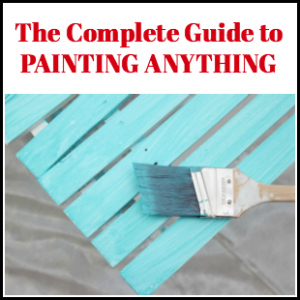 As long as you sanded the topcoat, you could definitely do another coat of paint over it. Jaime, how did your countertop turn out after using the Matte poly? I’m really considering doing this. This is pure genius! The finished look is outstanding and if by chance our next home has laminate countertops I will do this, because I know whatever we would buy will be a fixer upper. Our current townhouse has honed leathered black granite that actually resembles your finished project. I’m not sure, Samantha. You could ask a paint clerk at your local home improvement store if that is a food safe sealer. Hmmmm……my brother runs a convenience store-gas station in FL. The huge island counter has cracked, stained and gross faded red laminate. It’s already popping up off the wood. I’m seriously thinking about flying down and performing a DIY intervention on this nasty counter beast! This is brilliant. I will do this, because I know whatever we would buy will be a fixer upper. I loved the finish with the chalkboard paint, but because this is in my kitchen I did one coat of a satin poly and it totally changed the look. 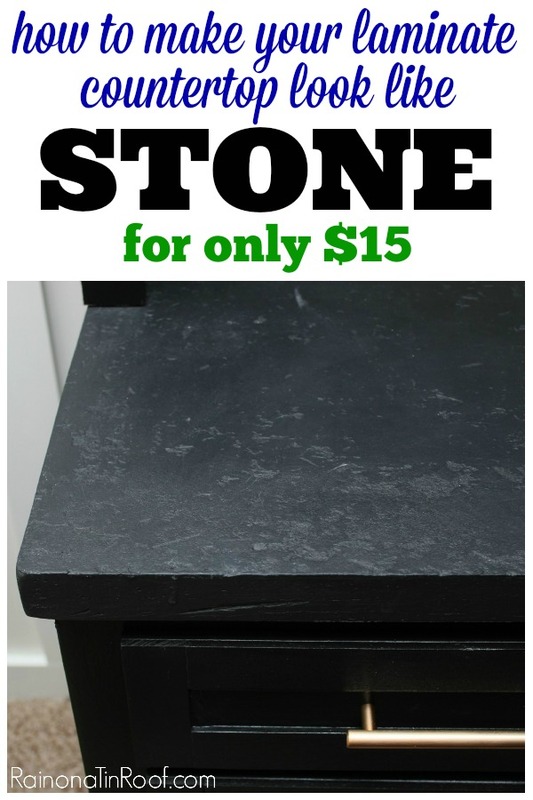 Black soapstone would just look so good in our house too. Thank you for putting this up. Do you think it would work and look just as good using white chalk board paint? I think it would work fine. I don’t know about the look – I think that would be a matter of preference. We just removed the laminate on our utility room counters and we are left with a sticky residue from whatever held the laminate onto the wood. What did you use to remove it? The palm sander didn’t budge it. Hmmm. I didn’t have any sticky residue left on mine. You could try TSP to remove it. Does it hold up to water and heat, bumps, cuts etc? We’re really rough on cabinets and cook all the time. Hi Lorrie! I would suggest always using a potholder under hot things when you put them on the countertop. I wouldn’t let water sit on it either. Love this idea! Redoing our kitchen countertops and I will be doing this, but I’m looking into polyurea as the sealant. I’ve read reviews and its super shiny and glossy but seen that you can add an additive that tones that down. Also read that by adding the additive makes more texture. Thinking this is a win-win for the soapstone look and safe kitchen use! What do you think? Love what you did!! I have my laminate removed and have 3 coats of balk chalk paint down. This is in the kitchen so I have satin gloss polyurethane to cover. But I’m now nervous that it’s going to be shiny and not muted soapstone-y. Any advice? Satin usually isn’t too shiny – I think you should be fine!